Southwest's Aashlyn Sulaica demonstrates the proper form while making one of her 13 digs. AREA TEAMS INCLUDED: Brackenridge, Burbank, East Central, Edison, Fox Tech, Highlands, Highlands, Holy Cross, Jefferson, Lanier, South San, Southside, Southwest, Young Women’s Leadership Academy. Southwest’s Aashlyn Sulaica demonstrates the proper form while making one of her 13 digs. Jefferson (11-0) needed to work overtime Tuesday to preserve its spotless record at Jay (4-4), but they were able to prevail in the non-district match. The Mustangs lost the first game 17-25, but won the next two by identical 25-22 scores. Jay, whose mascot also is the Mustangs, forced a fifth game with a 25-15 win. Fifth games usually are only to 15 points, but the winning team must win by at least two points. Jefferson couldn’t pull out the match until the game score reached 19-17. Senior Cecilia Campos led Jefferson with 30 digs. Gabby Vasquez recorded 16 kills and four service aces. Madelyn Chavez and Marissa Vargas each notched two blocks. Jefferson will try to maintain its unblemished record this weekend at the challenging SAISD Tournament. Southwest (4-6) has picked up a pair of wins so far this week. 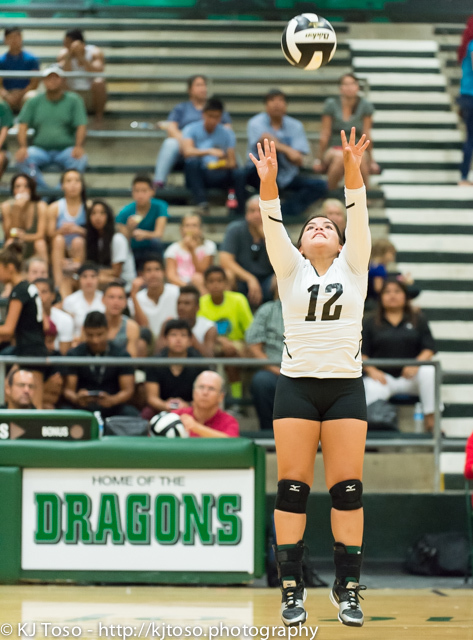 The Dragons defeated Highlands (0-0) at Monday and Harlandale (2-5) Wednesday, both in three games and at Southwest. Against Harlandale, the Dragons won 25-19, 25-17, 30-28. Defense set the tone as three Southwest players recorded more than 10 digs. Junior Megan Hernandez finished with 13. Brandy Martinez and Amanda Solis chipped in 11 apiece. Southwest received nine kills from Kassandra Cruz and eight from Aashlyn Sulaica. Angie Aguilar contributed 16 assists and two aces. Yasmine Garcia dealt six assists. Six-foot sophomore Brie-Anna Armstrong recorded two blocks. For Harlandale, sophomores Tanya Ramos and Valeria Stokes each made five blocks. Kianna Sandoval contributed 11 assists, 10 digs and three aces. Dominique Delgado also added 10 digs. In the Highlands match, Sulaica contributed 13 digs and nine kills, leading the Dragons to a 25-21, 25-13, 25-20 victory. Cruz also slammed nine kills. Martinez led with 17 digs. Aguilar dealt 10 assists and Dori Martinez provided eight in Southwest’s 6-2 offense. Hernandez served three aces. Highlands received 13 digs from sophomore libero Kiara Pesina. Jazmine Jackson finished with eight kills. Analisa Garza distributed 10 assists. The Owls lost a tough match 25-23, 16-25, 25-23, 21-25, 15-11 to Roosevelt (4-8) Wednesday at Littleton Gym. Highlands senior Emily Pearce led the Owls with 17 digs and shared the team lead with Sara Denton in blocks (3 each). Senior Angela Garcia dished 17 assists. Bryten Mitchan pounded 16 kills. The Cardinals (5-4) had won four of their last five matches after prevailing 24-26, 25-19. 18-25, 25-13, 15-9 over Brackenridge (1-6) Tuesday at the SAISD school. The host Eagles had Southside on the ropes, winning two of the first three games. However, the Cardinals finished strong. Junior Ashley Sanchez led the Cardinals with 16 digs and nine kills. 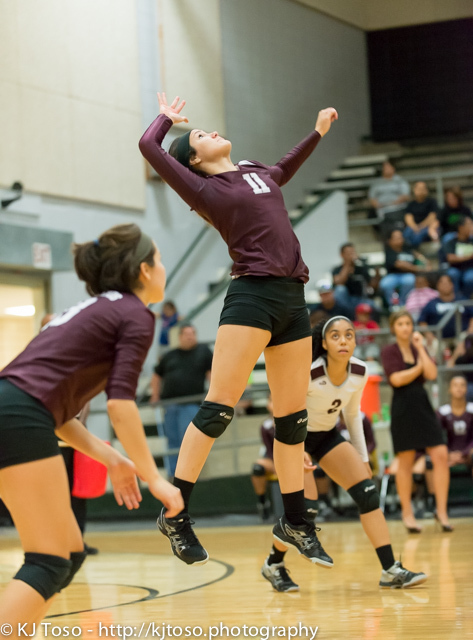 Sophomore Alyssa Gallardo supplied 26 assists and eight digs. Analee Uriegas had 25 digs and served three aces. Mia Soto added team highs of 14 kills and five aces, to go with four digs. Other key contributors were: Tyler Bolton (12 assists, 2 blocks), Chloe Davis (4 kills), Briana Martinez (10 kills, 5 digs) and Brianna Rodriguez (8 assists, 3 aces). 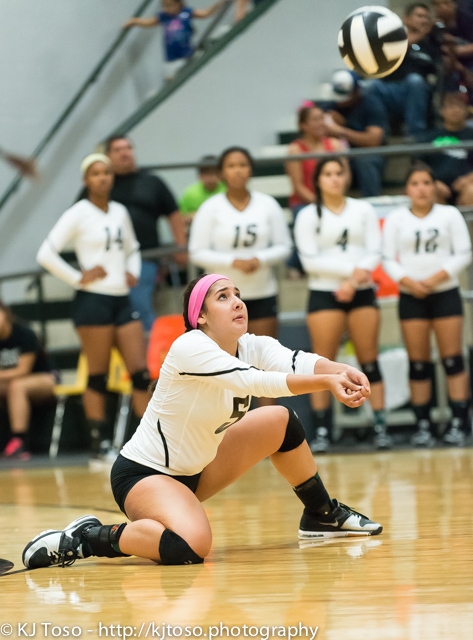 Brackenridge was led by seniors Jacky Nevarez (16 digs, 14 assists, 2 aces) and Kathy Sifuentes (26 digs, 4 aces). Skyler Reyna led the Eagles with seven kills and made 19 digs. Emily Martinez tracked down 17 digs. Courtney Hansford finished with three blocks while Eshe Malone had two. The Hornets (3-6) roared to an impressive 25-14, 25-19, 25-12 win over Roosevelt Tuesday at East Central. East Central freshman Skyeler Embry played a strong all-around game with 16 kills, 10 digs and three aces. Senior Madison Simon recorded nine kills and six digs. Dual setters Kaylin Mills (8 digs, 4 kills) and Alex Pena (6 digs) each finished with 16 assists. Brandi Campos tracked down 17 digs. Christie Cosper added four kills and 2.5 blocks. The Bobcats (5-3) bounced back from a three-game loss to tough Antonian Monday to down the Bulldogs (4-6) a day later. South San won 25-17, 25-11, 25-8 at Burbank. Seniors Mariah Gonzalez and Nicolette Lopez each served four aces for South San. Kaitlyn Serna led the Bobcats with four blocks. Lauren Estrada and Erica Jimenez produced a team highs with six kills and 12 assists. Burbank received 12 digs from Katherine Regalado and two blocks from Yesenia Munoz. The Knights (6-1) thumped Edison (1-6) 25-7, 25-13, 25-12 Tuesday at location. A pair of sophomores led Holy Cross. Henrianna Ibarra hammered 14 kills and Daisy Flores served seven aces. Victoria Gonzalez made 15 digs. Stella Ramirez distributed 12 assistgs. Edison received eight digs and four assists from sophomore Marissa Cortinas. The Voks (2-5) notched their second win Monday in a non-district match at Pearsall. Lanier closed out the victory in three games, 25-21, 26-24, 25-19. Sophomore setter Rae Ann Douglas was the Voks’ pacesetter with 19 assists and three service aces. Junior Jenny Flores contributed nine kills. Esmi Garza added seven digs.